As a part of social and economic development initiative in Manipur, KEN members have taken a commitment to bring a change in Manipur by providing skill development for the youth of Manipur to generate employment for economic independence. Economic Independence by way of income generation for basic needs and livelihood and aspirations for a better life is the main driver for the growth of a community, a state and a nation. Discussion with IIM Ahmedabad Professors on the development of IT industries in Manipur. Invitation to Mr Raman Roy, who is also known as father of Indian BPO by KEN to meet the Government of Manipur officials to bring in BPO in Manipur. Visit of Government of Manipur officials to Quatrro office in Gurgaon by KEN initiative. Visit of India – US Technology Summit by KEN and Government of Manipur officials. 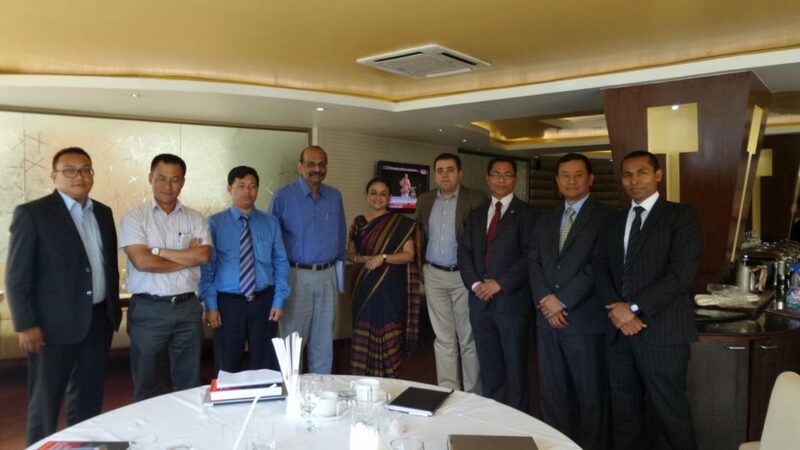 CII’s North East IT Summit visit by KEN and Government of Manipur Officials. Fig. Left to Right – RK Herojit (KEN), Deben Nambam (GOM), Dr. Jayanta Yumnam (KEN), Prof Premchander (IIMA), Prof Sundaravalli N (IIMA), Prof Amit Karna (IIMA), Bishwajit Okram (KEN), Lakshmikant Laikangbam (KEN) and Rajesh Prasad (KEN). During the meetings with the Government of Manipur officials with KEN members, RK Herojit, a member of KEN proposed the Idea of Employment Generation through Skill development. The Idea was appreciated by all and a PPP (Public Private Partnership) pilot project was initiated through his company, HASK Skill Development Centre Pvt Ltd (HSDC). With his network and experience RK Herojit started working on the project and a MOU was signed with Government of Manipur and HSDC on 30 March this year and ITI Lilong was handed over to them. Despite the difficult conditions of the infrastructure and several bottlenecks in logistics issues, there was no wavering of effort in getting the project executed. Initially the training classes were to commence from May 2015, however several factors including severe dislocation in the approach road to Imphal from Dimapur had delayed the commencement of the class which could function only from 05 Oct 2015. The ITI Lilong was lying dormant for about three years before it was handed over to HASK Skill Development Centre Pvt. Ltd. (HSDC) by Government of Manipur. HSDC is a company promoted for this initiative by the Singapore based HASK Group of companies owned by R K Herojit. HASK Group is a service provider in Oil & Gas industries providing services to various world class companies like Siemens, Toshiba, and Veolia etc. HASK provide services in Singapore, Indonesia, Philippines, and Malaysia with offices in these countries. The well-equipped and one of its kind only in the state skill training centre was inaugurated on 12th October by Shri O. Ibobi Singh, Hon’ble Chief Minister of Manipur along with Shri I. Hemochandra Singh, Hon’ble Minister for Labour &Employment and PHED and Md. Abdul Nasir, Hon’ble Minister for Agriculture and Fisheries. The target group of this skill training centre will be the youths who continued their studies up to class eight or ten due to economic and other reasons. This centre will be a feeder for employment to the Oil and Gas industry in South East Asia – Singapore, Malaysia, Indonesia and Middle East Countries. Besides, the centre will also be offering customized training courses to cater to the requirements of the upcoming projects in Manipur like the railways and other major constructions so that these projects could be executed through local resources. RK Herojit the architect of this initiative is a Singapore based entrepreneur with fifteen years of experience in Oi & Gas Industries. He holds a degree in Mechanical Engineering from Sardar Patel University, Gujarat and Executive Education from Harvard Business School, National University of Singapore, Nanyang Business School and IIM Ahmedabad.